We spent all day today doing some training for different groups of leaders. Lee and Sarah met with the Sunday School teachers. Catrina and Zoe talked to the volunteer women and Sean and I met with the pastors. It was a step into the unknown for everyone as culturally our setting is so different to theirs but everyone seems to have really connected with their groups. Meanwhile Howard Reece-Smith has gone off to the Mission Hospital about 50 miles away to perform a Caesarean-not sure when we will see him again! Tomorrow we are off to see two more projects-updates on those tomorrow night. I'm sat on the plane next to Catrina and my great friend Sean Green hoping to get this written before they tell us to turn off phones! First reflecting on a great week with Adrian Holloway. He gave us such a clear call to share our faith in real, non pressured ways - I've already talked to one guy at work today which I'll now analyse differently because although he wasn't saved he's hopefully got a better view of Christians. Then looking forward to the forthcoming trip and seeing how the project is going. Keep looking at the blog for updates. As parents we're very happy to invest not only our time but also the money which all of these things cost. That's because we see the physical and emotional benefits these things bring. But we also want to be very careful to invest in our kids spiritual development too. That's why for us finding the money to send our three to the Oakwood Youth camps and to RockNations has always been a real priority. This year that's going to cost us quite a chunk of money, which is going to be even more of a challenge for us to find now I'm working full time for the church. But we know that in years to come some of the most significant moments in their spiritual journeys will have taken place at these events. So I encourage all parents with children aged between 8 on the 22nd May to those currently in year 6 to book them into the Oakwood Kids Camp from the 22nd to the 25th May. And all those with youngsters in year 7 and older to book them into the RockNations conference in Bradford from 5th - 8th August. More details on both events are available from The Kerith Centre reception. It may mean you having less money to spend on other things, but I believe it is an investment you'll never regret. I also realise that for some your current financial situation will mean there is no way you can afford the cost involved. Well we don't want finances to be a barrier to any young people going to either event, and have funds available to cover the fees for any family in this situation. Just speak in confidence to either Yvonne Scott or Lee Layton-Matthews and they will be able to help you. Or maybe you don't have children who could go to either of these events but know of a family in the church you could help financially - then why not go ahead and have that conversation with them. Let's make sure we do everything we can to invest in the next generation, both individually and as a community. Judging by some of the feedback I've had great things have been going on in our parenting courses. When Catrina and I lead "The Marriage Course" we often found that people thought it was only for marriages which were in trouble. The reality however is that every marriage, however good, can be improved, and the same would be true of our parenting skills. We're just about to run the 5-15's parenting course for the 4th time. It starts at 8pm on Tuesday 28th April, more details on the website or from reception. So why not take a look and sign up for the next course. Prayer is at the heart of what it means to be a follower of Jesus Christ. Not as some religious observance which will make God happy, but as an ongoing, two way, daily conversation with our creator. Jesus teaching in Matthew 6 was not "if you pray" but "when you pray". One of my passions is that we would release and encourage people to pray in all sorts of different styles and settings. Sometimes big groups. sometimes small groups, sometimes with a particular request or theme in mind, sometimes just to meditate and listen to God. So I'm really excited about the women's prayer (not that I'll be going of course) on the 27th June. There are loads more details on the website so take a look and book up. And husbands, be encouraging your wives to go (and look after the kids and do the shopping), as if your wife flourishes you will flourish too! One idea I have (and this is why the men needed to keep going) is to have a room in The Kerith Centre set aside for people to go to and pray in during the day. I'd envisage having some comfy chairs and books on prayer in there, as well as some swords on the walls to remind us that prayer is warfare and to stop it getting too girly! It's definitely something I'd want as we plan the proposed new building over Kerith Centre car park, but shorter term if we could find a room is that something people think would be useful? If you have any thoughts then why not leave them as a comment. Just be glad I don't share all of my wacky ideas on here! Another new blog to tell you about today. This time one for our HIV and AIDS project in Serenje. Eight of us are going to be going off to Zambia on Monday to see how the project is developing, and to meet with some of the pastors, teachers and children's workers out there. We'll try and update the blog whilst we're out there with information and photos, so keep checking for updates. Longer term we're also planning on using the Serenje blog to provide regular updates on how the project is going. I'm so grateful to everyone who last Autumn gave so generously to the offering we had for Serenje, and want everyone to be able to see what the money we have given is doing - hopefully the blog will help with that. I also want us to be inspired to give again in October, as we look to raise another £100,000 to fund year 2 of the project. 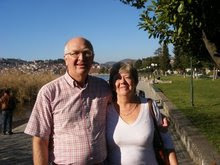 Many of you will know of the amazing stuff Ken and Ann Bothamley are involved with in Albania and some of the other Balkan nations. In the past I've done a number of blogs to keep people updated on what they're up to, but now they've gone one better and started their own blog, which is so cool. They're off on Thursday for a five week trip to Albania, and have promised to update the blog whenever they're near to an internet cafe. Why not sign up for email updates whenever they add a new entry, and don't forget to add comments as I'm sure they'll find that a great encouragement. I love the way more and more people are using technology to keep connected. It can never replace face to face contact (you can't share a latte over the internet) but it is a great way of people keeping in touch. Next Sunday we've got Adrian Holloway speaking at all three meetings. Adrian is an evangelist at ChristChurch which meets at Piccadilly Theatre in London, as well as being a best selling author. Before that he worked as a newspaper journalist in London with The Times and as a radio and TV presenter. I met up with Adrian at a leaders event last year and felt it would be great to have him come and speak to us, particularly on encouraging us all to be more outward looking. He's an excellent communicator and would be great to invite friends to come and hear too. I'm not a huge reality TV fan, but was incredibly inspired seeing a YouTube clip of a lady called Susan Boyle on "Britain's Got Talent". If you haven't seen it already then take a look below, or if that doesn't work follow this link. The transformation from the judges and audience laughing at her at the start to the standing ovation at the end is just inspirational. A great reminder that "Man looks at the outward appearance, but the LORD looks at the heart". That He takes great delight in you, and rejoices over you with singing, and that his approval is far more important than that of Simon Cowell or anyone else. Why is it that we often find it so hard to live the "life to the full" life which Jesus promised? I know for me that in the first few years of my Christian life it was that I was still being defined by my past failures and my old ways of thinking, rather than understanding who I now was in Christ. That the "Great Exchange" which took place when Christ took all my sin and brokenness and gave me his life in return (see Zec 3:3-4) wasn't just some theoretical exchange, but changed everything about who I was, how God saw me and how I needed to see myself. I know no better way of getting that stuff into you than the "Freedom in Christ" course. If I had my way I'd make it compulsory for everyone who wants to be part of the Kerith community, just because I know it will do you so much good! The next course starts on Wednesday 22nd April. There are more details on our website, and there will be people in reception on Sunday next to the "Freedom in Christ" banner who can answer any questions you may have. If the cost of the course is a problem then just let us know as we don't want that to be a barrier to anyone coming along. In an age dominated by people spending so much on self help books and courses, many of which are frankly nonsense, come along and get some concentrated truth into you! Next week we've got our monthly prayer meetings on Wednesday and Thursday (22nd and 23rd April) at 8pm. I'm tempted to start calling these PVC nights as they're evenings to Pray, get a fresh reminder of our Vision and share Communion together, but somehow PVC doesn't convey quite the right image! Anyway, that's what we're going to be doing, along with worship and a chance to thank God for all that happened over the Easter weekend. In the vision section I want to share some exciting updates on our involvement in other nations, including news on the churches we're involved with in Zambia, Kenya, Lithuania, Poland and Albania. I'll also be sharing some Kerith news and updates on a couple of things we've prayed about over the last few months. Mixed in with all of this will be prayer for each of these situations, as well as time to pray for one another and in particular those being impacted by the credit crunch. Louie Giglio would love this! 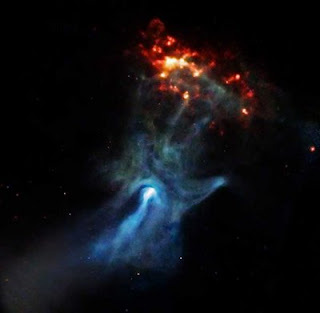 I saw this picture taken by a NASA satellite, which has been dubbed "The Hand of God", and thought you might like it if you haven't seen it already. Well what an Easter weekend! The all new Good Friday meetings seemed to go well. People really seemed to enjoy "The Lion, the Witch and the Wardrobe", with quite a number asking when we're going to be showing "Prince Caspian"! The evening meeting was really well attended too, with large numbers of visitors at both. Then on Easter Sunday I think the final count of people baptisted was 22 - a great way to celebrate Christ's resurrection. We also saw a number of people make first time commitments over the weekend - very cool! One question will be what we do for Good Friday next year. There seemed to be a real appetite to meet and reflect on the cross so I'd be interested to hear peoples comments. Next Sunday we start our series on the Holy Spirit. I'm going to be posing a number of questions as to how we see the work of the Holy Spirit in the context of our Kerith Community - I'm looking forward to us engaging in that conversation together. Have a great rest of the Easter holiday and hope to catch you next Sunday. Our next evening Alpha Course is going to be running in Costa Coffee in Bracknell Town Centre (only a five minute walk from The Kerith Centre). Having run Alpha for years in our building we thought it would be a great idea to try it in a different venue, and Costa seemed ideal for what we wanted to do. The course starts on Wednesday 29th April and will run each week from 7-9pm. There will be the usual Costa range of coffees, teas, cold drinks, paninis and cakes available. People need to buy their own food and drink, although we don't want that to be a barrier to anyone coming so please let us know if that is going to be a problem and we can help you out. Given the nature of the venue we'll be making the talks shorter which should make it more accessible. We will be taking the whole place over, so don't worry about us disturbing anyone else in there! Alpha is a great course, not only for people investigating Jesus and his claims, but also for new Christians and for people who feel they need to be reminded of the basics of their faith. I so benefited from teaching on it for a number of years and the truth it put into me. So if you'd like to come along, or have a friend you'd like to bring, just fill in an application form at reception and we'll look forward to seeing you on the 29th. Just a quick reminder about the Easter events coming up. Good Friday afternoon at 2pm we've got "The Lion, the Witch and the Wardrobe". Refreshments are available but you'll need to bring your own popcorn! Then in the evening we're looking at the cross, and the exchange that God offers us as a result of Jesus death. Everyone is going to get a red paper clip, so come along and find out what that's all about :-) Coffee is served from 6 and the meeting starts at 7. Then on Easter Sunday we've got baptisms at all three meetings (9am, 11am and 7pm). Currently we've got over 20 people being baptised which is really exciting - coming along and hear some amazing stories of how Jesus changes lives. Hope to see you at least once over the weekend. One of the most memorable for me at years Leadership Summit was Bill Hybels talking about those moments which remind him "this is what church is all about". Well after having a wonderful time being away for the weekend with Catrina celebrating our 20th Wedding Anniversary (and being thrilled to come back and hear great things about how much people enjoyed the Louie Giglio presentation) I had two of those "this is church" moments today. First of all I went over to Wexham Park Hospital this afternoon to visit Pete Novelle. Pete has cancer, and the doctors are trying to get him strong enough to start a course of radiotherapy and then to operate to remove the tumour. He's had a number of setbacks along the way, and currently is being fed through a nasal tube, but today got the news that an infection he's had isn't malignant, and that they hope to start the radiotherapy soon. It was great to be able to pray with Pete, and his wife Glynne, and ask God to break in as only He can. Both Pete and Glynne were saying how amazing the support of the church has been through it all - it reminded me again what a privilege it is to be part of this community. Then when I got back to the Kerith office Leta from Lithuania was there. Leta came over last Monday with Saulius who leads the church there, and Valdas who is one of their elders, primarily to meet up with BenDand myself to talk about the way ahead for our relationship as churches. Saulius and Valdas flew back to Lithuania on Wednesday, but Leta stayed on for a week of meetings with all of our key staff members to learn about how we do church. She's going back tomorrow morning but was telling me this afternoon how much she's got out of the trip and how much our church is where they see themselves being in a few years time - very exciting. Hopefully a big crowd will come over from Lithuania for the Willow Leadership Summit again this year. So two very different meetings, but both expressing in different ways what it means to be church. This week we've got the NewFrontiers year team trainees with us for three days, getting amongst other things a good dose of BenD - they won't know what's hit them! Then our Good Friday and Easter Sunday celebrations - bring it on!